The villagers move as one unit, but you don’t have any specific weapons or tools at your disposal. Instead, you have to use whatever you can find lying around as projectiles, whether it’s a hay bales, picnic table or even cars and telephone booths. The larger your mob, the heavier and larger objects you can carry and throw. The size of the object determines how many Vikings you are able to eliminate. The aim of the game is to take out the Vikings as quickly as possible, without taking casualties. In a nutshell, you can think of it as Viking bowling using any object you can find lying around. You want to take out as many Vikings with a single object as possible, and having big mobs help with this as you are able to pick up and throw larger objects. The single player challenges revolve around completing levels within a certain time limit, taking certain amount of casualties and achieving big scores. Each of the stages in the main campaign mode as set around a common theme. 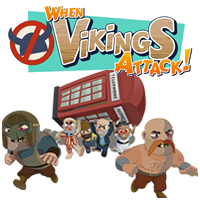 You control your mob and move from area to area, taking out Vikings as you go along. You can choose your game to be public or private. Hosting a public game allows anyone to join you in your fight, while private games means others have to be explicitly invited. The campaign mode is co-operative, but each player gets individual scores at the end. On a PS3, you can play co-op with either a online player or with a local player. The separate multiplayer mode lets you play with up to four players (either playing on a PS3 or PS Vita, thanks to cross-play) to challenge each other in various modes, including Last Man Standing or Vikings Vs Vigilantes. Public service broadcast-style tutorial videos introduce any new techniques or game mechanics as you work through the main story mode of the game. Having certain types of people in your mob give the entire mob special abilities, such as increased speed or strength. Special items are also introduced later in the game, such as bombs. 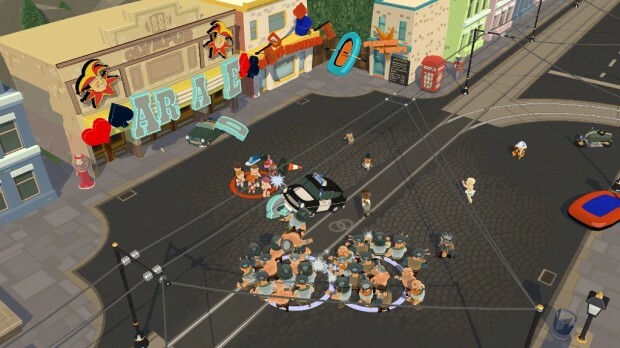 The game is cell-shaded, giving it a cartoon feel. Each stage is nicely designed and detailed, but the fast-paced action will mean you won’t always get to appreciate the details and subtle features. The game has many different types of Vikings and villagers, each with a unique look and build. Everything in the game looks crisp and detailed, and the pretty environments makes the game pleasant. The controls for the game are quite simple. You can pick up and throw objects with one face button, and dash or intercept objects with another. Movement is with the left analogue stick, while the shoulder buttons ( and ) can be used to rotate objects once picked up. The simplicity of the controls does mean the game can get quite repetitive rather quickly, especially since the game doesn’t require a great deal of skill. The game features many sound effects when throwing and picking up objects, as well as character voices. Some of the sound bites include humorous comments like “ooh, me back” as you pick up a park bench or picnic table. The background music is another matter, which is quite repetitive and annoying at times. The music isn’t bad, but listening to the same tunes over and over again will do your head in. To get over it, turn down the music and instead listen to the hilarious comments from the in-game characters. For a sub-£10 game, When Vikings Attack is difficult to criticise. It’s fun to play and the multiplayer options are extensive enough to offer countless hours of enjoyable gaming. Even better is that the game supports both cross-play and cross-buy. Purchasing either the PS3 or PS Vita version will bag you the other completely free, and all for under £10. And if you pre-ordered the game or purchased it within two weeks of launch, you get an additional 30% off the title. The only downside of the game is the game’s repetitive-ness, and that’s mainly down to the game’s simplicity. Don’t expect to be a serious game, it’s targeted towards casual gamers, and doesn’t require precision or skill. It’s a perfect title to pick up and play when on the go. The game even has a handful of trophies you can collect.